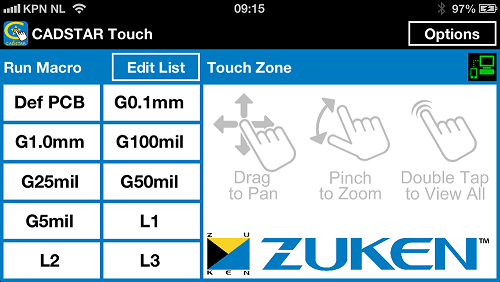 One of the leading PCB design software vendor Zuken has developed mobile app to control PCB design layout using smart phone and tablet computers. PCB designers can simultaneously control and program functions on Zuken’s CADSTAR expert desktop PCB design software using the smart phones and tablets. Ian Broughton, Senior Electronics Design Engineer, C-TEC says: "There are some real benefits to be gained from using this App - especially the numerous small time savings and the ease-of-use that it offers. As long-time users of CADSTAR, we are pleased to see the continual progression of the software and that Zuken has been quick to adopt apps, making use of devices that are now part of everyday life." The latest CADSTAR release also features enhanced Activ-45 router and pusher technology that makes changing existing designs significantly faster and easier. The Mobile app which supports iOS or Android based mobile devices uses Wi-Fi connection to communicate with your PC. Android users can also control the program through voice commands. Features offered include: pinch to zoom, drag to pan and double tap to view all. Designers can customize the App to give quick access to user-defined macros for the CADSTAR functionality and sequences they use most often, thus saving time. CADSTAR Touch can be downloaded for free from Apple and Google's online store. The Activ-45 router helps in routing through densest areas of a design by using enhanced pusher technology, the route path will follow the cursor with minimum disruption of existing routing patterns. The Activ-45 router makes space for new lines of collection by pushing existing routes and vias aside by following the design rules. If necessary it can flip existing routes over pins and pads to create even more space, such as when creating a BGA fan-out. At any point before completing the route, if the cursor is moved back towards the starting point, the routes will spring-back to their original position.